Continuation from Toraja Special Funeral Rambu Solo Ceremony. 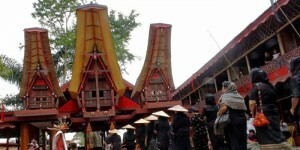 Tana toraja’s traditional funeral is indeed unique. The uniqueness is even well known to foreign countries. The custom ritual in each procession is full of meaning. 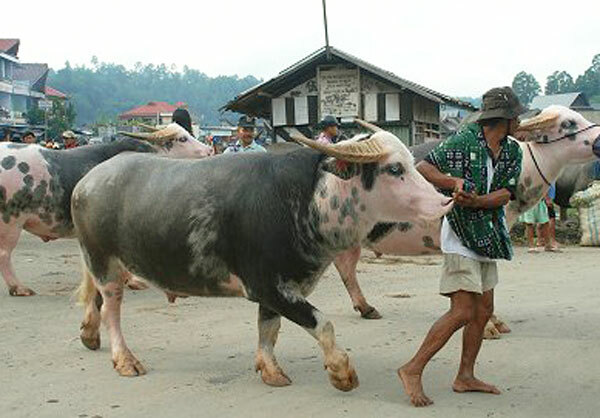 So, when you visit Tana Toraja to watch the funeral ceremony, there will be many amazing things. But there’s only one thing that will make you surprised, that is the cost of holding Rambu Solo. As you’ve known before, funeral ritual of Tana Toraja, Sulawesi island usually held months or even years after someone’s death. This long time happens due to the left family members need time to collect enough money. And do you know how much cost does a family need to perform Rambu Solo? A single Rambu Solo ceremony can reach to 4-5 billion rupiahs, or equal to USD 400-500,000. 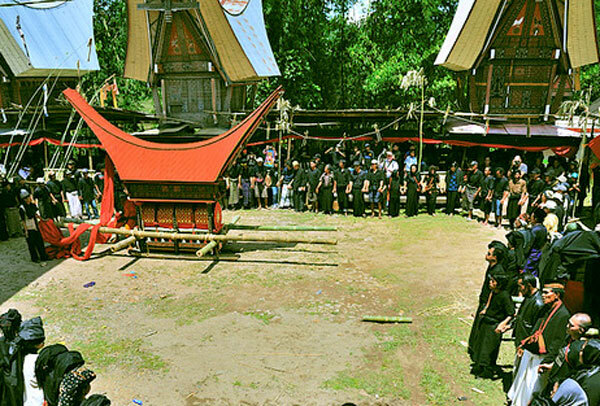 Averagely, Rambu Solo is held with cost hundreds of million rupiahs. Rambu Solo is not a funeral ceremony. In this funeral ceremony there are many conditions and supporters for an ideal Rambu Solo. One of conditions in performing Rambu Solo is the sacrificial animal in form of buffalo and cow. For Torajan people, buffalo is a sacred animal. And in this ceremony, buffalo become the main aspect. According to Torajan people’s belief, buffalo is the animal which will bring the dead spirit to Puya. The more buffalo sacrificed in this funeral, the faster the dead spirit to reach Puya. The sacrificed buffalo is not ordinary buffalo. They’re Tedong Bonga Belang, from Bubalus bubalis species, or usually known as mud buffalo. This buffalo characteristic can be seen from the albino and spotted skin. Price of a buffalo is 20-50 million rupiahs or equal to USD 20-50,000 each. The amount of buffalo which will be sacrificed is depends on the social level of the mourning family. The higher the social level of a family, the more buffalo will be sacrificed. For a middle social family, they usually have 8-10 buffaloes, and add for 30-50 of pigs. But for the royal family, they can have 25-150 buffaloes. That’s why, it doesn’t come to surprise if the funeral cost can reach to 4-5 billion rupiahs / USD 400-500,000. Most of the expenses are used to buy for this sacrificial animal. 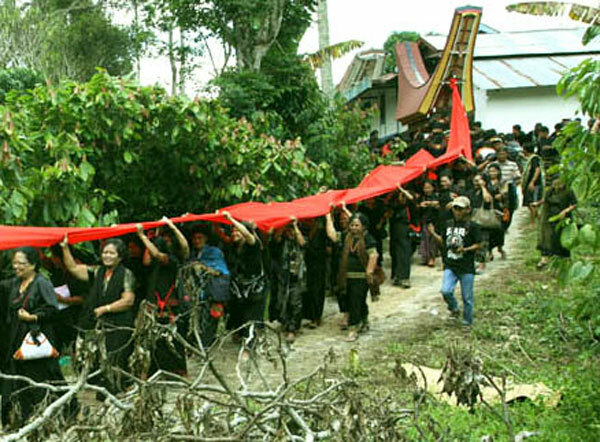 The buffaloes purposed for sacrificing of Rambu Solo, will be paraded surround the village first as a form of respect. Approaching early evening, there’ll be buffalo fighting. After this show, those buffaloes will be slaughtered, and the meat is given to people who have helped the Rambu Solo process. Beside the condition of sacrificed animal, another thing that is obligatory in Rambu Solo ceremony is the jewelry miscellaneous. For example, the coffin is usually decorated with traditional cloth, rope, gold and silver miscellaneous. In addition, inside the coffin will also be put various things as ‘trip supplies’ to go to Puya. Those things are cloths, various kinds of jewelry, and some money. Other things belong to people who died long ago will also inserted in the coffin. Those things are conditions in Rambu Solo ceremony as a worship and supply for the dead so he can do the trip to Puya. After doing the Rambu Solo ceremony, the dead person will be paraded and taken to the cemetery in the wall cliff. Usually, they will spread a long red cloth, with the coffin in the rearmost. Besides the family and relatives, the whole villagers will come to take the dead body to Lakkian.